This product without a doubt completely outshines other drawing tables due to it unrivaled quality, strength and durability with a lifetime guarantee. It satisfies all the expectations that it is required to provide and fully giving value for your money. The DesignMaster has a table height of 37“ with a top angle that can adjust from 0 to 45 degrees .The base of the table is composed of a steel tubing that is 18-gauge; with all its metal constituent parts being scratch resistant and electro-static powder coated. This ensures provision of long-lasting and reliable functionality of this product. The legs are attached together to form a 3” by 2” post fixed to ensure maximum strength, stability and rigidity of this table. The surface of the table is smoothened and durable with the top board and supporting panel which is made of Melamine material. The table has bonded quality plastic edges that are perfectly trimmed proving the high quality of this table. Tool and reference drawers can be offered with the purchase of this table. The dimensions of the accompanying tool drawers measure 23”l by 8”w by 3.25”d and the reference drawer having dimensions measuring 31” by 23” by 1.5”H. The tool drawer is purchased with attached locks and already fitted with ball bearing slides. Built in fittings are also available on the purchase of the two drawers. Compact Version-This is an available smaller version of the original product but has the quality, strength and efficiency as the full-size table. Its Table top board is smoothened and durable; made of the same high-quality materials and same table height of 37”.It offers all the needs the buyer expects from the larger version. Office Version-The specifications for this table include a base height is 29.5” for appropriate access from your locality of work or desk. 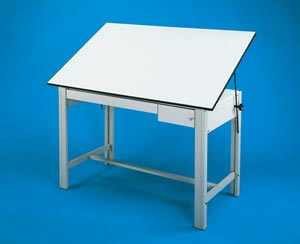 It has the same quality, features and a table top size as the DesignMaster Compact version.